This week our Etsy shop, ck silver, comes to us from mother/daughter team Marilyn and Cindy. ck silver specializes in classic silver pieces that blend in pearls, semi-precious stones and Swarovski crystals. If you don't see a specific color or maybe need something in a different design feel free to contact Marilyn and Cindy as they are happy to work with you on a custom piece. As an offer to all of the Joy De Vivre readers, ck silver is also offering 20% off all products this week in their shop. Just tell them you saw their feature here to get your discount! 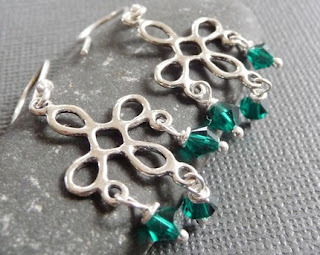 Featuring vivid emerald swarovski crystals wire wrapped onto sterling silver, these are certainly going to be noticed. If you want earrings that will get you complimented or a present for someone with a May birthday, I think you have found them with this pair! After all of the bland winter colors isn't is great to break out into the spring season with a gorgeous color. 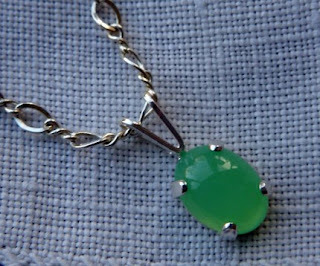 I am sure you will agree that this beautiful green shade in the Chrysoprase Cabochon does just that. 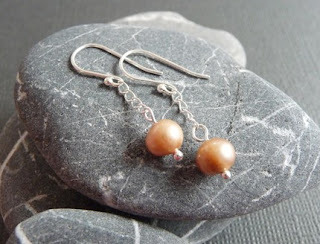 These sterling silver and pearl earrings are a great neutral earring in an anything but boring style. Dressed up or down, these are sure to go with many different outfits! 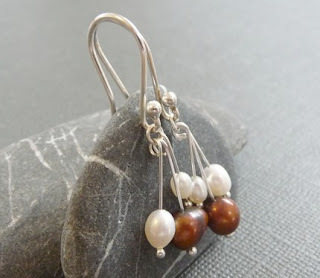 the Pearl Drop Sterling Silver Earrings! 1. Check out ck silver's shop. Come back here and comment on your favorite item in the shop. 2. Be or become a follower of this blog and earn a second entry. Entries will be accepted until midnight Friday. Check back this weekend to see if you are the lucky winner! Don't forget to use your 20% off discount at ck silver this week! Thanks for the feature, Heather! It's beautiful! Hurry and get your orders in everyone while the 20% discount lasts! Wonderful feature great Twitter friends. Loving many designs especially the new twirly whirly earrings. Yes my favourites are the Whirligig ones too! Cindy has a lovely shop. Hard to pick. But I love turquoise so I think the turquoise dream silver earrings are my faves! I'm following now! And BTW...Barkley is very cute! Cindy's work is beautiful and she is such a lovely person too! Although it is hard to choose!! I'm following your blog now too!! I love Cindy! My favorite item is the chrysophase necklace you featured here! I am now following your blog, too. What a nice feature you've done! I love the dusty rose sterling silver bracelet. Cute stuff!! I LOVE LOVE LOVE Aqua Waters Earrings!